Last weekend I was in Oslo, visiting Janne that has Albert’s daughter Arista and also meeting another girl that has Albert’s son Gabriel (Aslan) who also was visiting Janne. 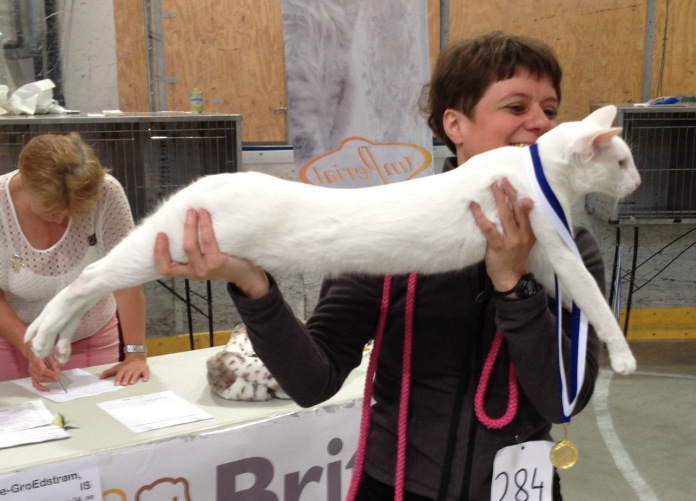 We also went to a cat show in Oslo, arranged by Norak. That was the first time I was in Oslo, and I was there without a cat of my own, curious to meet Albert’s offspring, and see how the shows in Norway are, compared to the ones I visited in Sweden. Both Arista and Gabriel have quite a lot of similarities to Albert, and Arissa to Jossan, in her appearance and posture. Gabriel is very friendly and sweet, he got the best of character both from his mom and Albert. 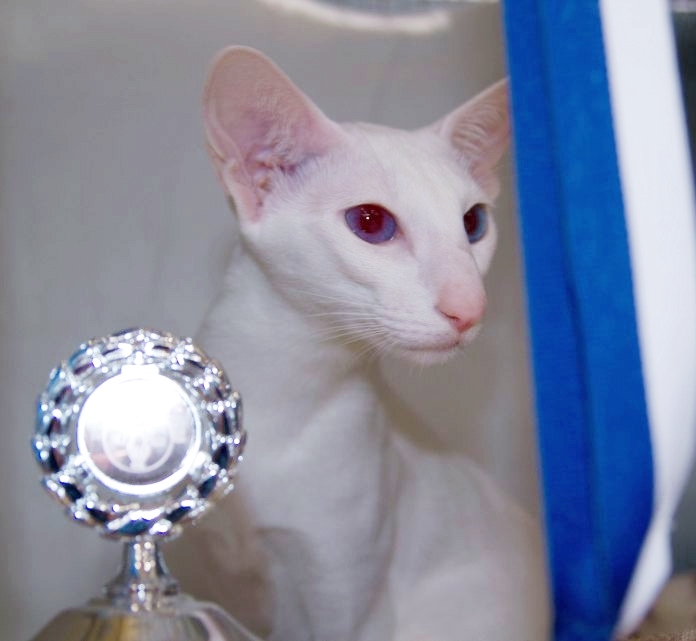 Arissa is pretty and a bit of one person cat, like many Siamese girls, including my Jossan. I got her one soft sack at the exhibition and carried her around like Albert and she liked that, it was fun to see all other cats. Sweet girl. I managed to see a bit of Oslo’s center, their magnificent Opera. Oslo is pretty, but even more expensive that expensive Stockholm. But so pretty nature, I loved the view, the buildings and the water and the green and the salty air. And people I met were kind and friendly. The cats did great at the show; our cat family appears to have some true star quality. 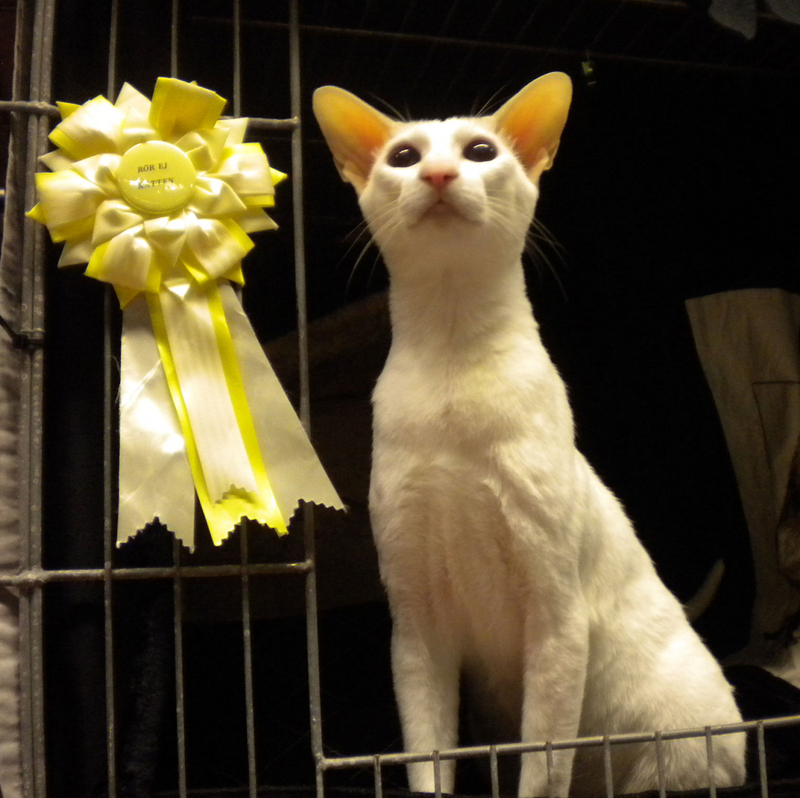 🙂 Arista won BIS (Best In Show) for fertile females, category IV on Sunday, and Gabriel was nominated as a neuter boy, but lost in panel (so he came excellent second best). Both got excellent critique. Arista also won BIS of all category IV in Norak, club that organized the exhibition. Janne wrote more about it here (in Norwegian). I borrowed pictures of Gabriel and Arissa from her she took them. We were all very proud of cats, how well they took it a and how nicely they behaved. I also was happy that the cats got such a kind and true cat lover for a judge the first day, Hans G. Lindberg (from Sweden). Gabriel was tired after a long trip to Oslo (he lives at the very north of Norway), and all the new impressions, and many cats at the same place, so he was crying a bit, tired and nervous, and probably more scared than anything else. You know, like Albert, but in a much lower voice. When he came up for the review, the judge took him carefully and cuddled with him, and talked to him, and hugged him until he relaxed and calmed down somewhat. He took his time, did not rush anything. I was so impressed! That resulted in one less stressed cat, less stressed cat owner, and the next day, after such a great first experience with the judge, Gabriel went to another judge’s table like he did only that all of his life! He was not worried and not scared at all. Mr Lindberg is a truly great judge; judging cats is not only about giving the correct review of the cat (which he did), but it is more than that, giving everyone better experience and love and making cats feel secure. I was so happy that we got him as Gabriel’s first judge. Thank you, Mr Lindberg (if you ever read this). It seems that Mom gave up on torturing me. There is always this new, really tasty food out, and I can eat as much as I want! Yum, yum! I still get Tasteless Mud few times a day as well, but it is actually not that bad (or I got used to it). I love my Mom and Dad, they are not that unreasonable after all. Mom said that I am the best cat in the world and such a good example for The Little One. Then she put me and the baby in the cage and Dad drove us to a place I had never visited before. It was a huge hall with hundreds of other cats and even more people. The Little One was scared, but I was just curious. I wanted to walk around and inspect the place. Mom put me and the baby in one big cage, arranged everything like a little room for cats, with a cat house and curtains and a litter box. We got food and water, too. It was good. I could see many other cats from there and when I told my humans to take me out and carry me around so I could see more, they obeyed. I liked being there. People came to me and admired my beautiful face and eyes, said how pretty and cool I was. I liked that not many stupid people were there. Mom took me to a lady with white hair that called me ‘Big Boy’ and everyone laughed. She said many good and true things about me, except for one – that my head could be bigger. Mom petted me later and told Dad that that was a nice way to say that I was fat: “He is not big, it is his head that is small”. I do not care, small head or not, I am the King. In the afternoon we went home just to go back to the same place the next day. The Little One was less scared the next day. She looked at me, and also, at her Dad who was there as well, and imitated my royal posture and utter coolness. A new lady judged our good looks this time, and she also called me ‘Big Boy’. She did not complain about my head (except for my ‘somewhat flat forehead’. Ha! SHE had a flat forehead! ), and she also told me many nice things. My humans carried me around again and I saw many cats of different races I never saw before. People came to Mom and asked about me and were surprised that it was my first time on a cat exhibition ever; I was so relaxed and cool. Yes, what did they think. I am cool. Like, the coolest cat ever. We were never that interested in exhibiting our cats; that takes a lot of time and also, cat shows are beauty pageants and for us our cats were already the prettiest in the world anyway! Our kittens’ dad Goofy has a title, he is a GIC (Grand International Champion, which is high title), but we would have liked him all the same even if he was not. Until a few years ago, and even now sometimes, there have been cats that got sick on exhibitions and some of the breeders had to stop with breeding completely after getting cats sick for life. I was very scared of that. But now, everyone is cleaning tables, cages and hands with alcohol and the cats are handled very cautiously, so the risk of getting some bug is very small. 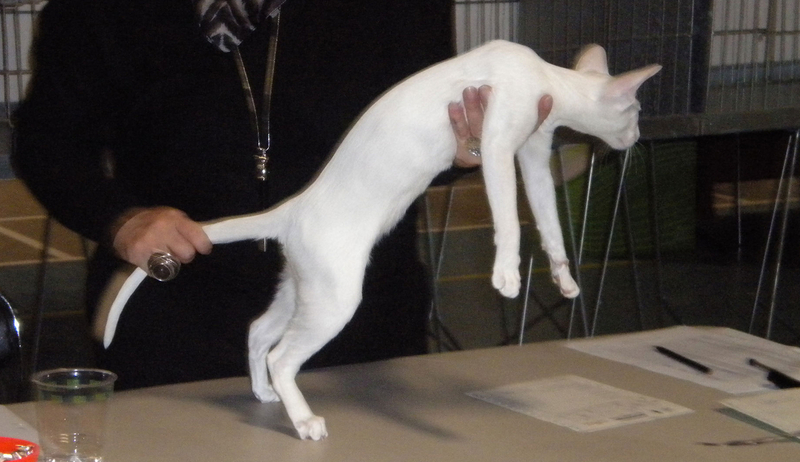 And of course, you cannot exhibit a sick cat and there is an obligatory veterinary check when entering the cat show. The infections are not that bad for big cats, but if you have small kittens at home, they can get really sick. 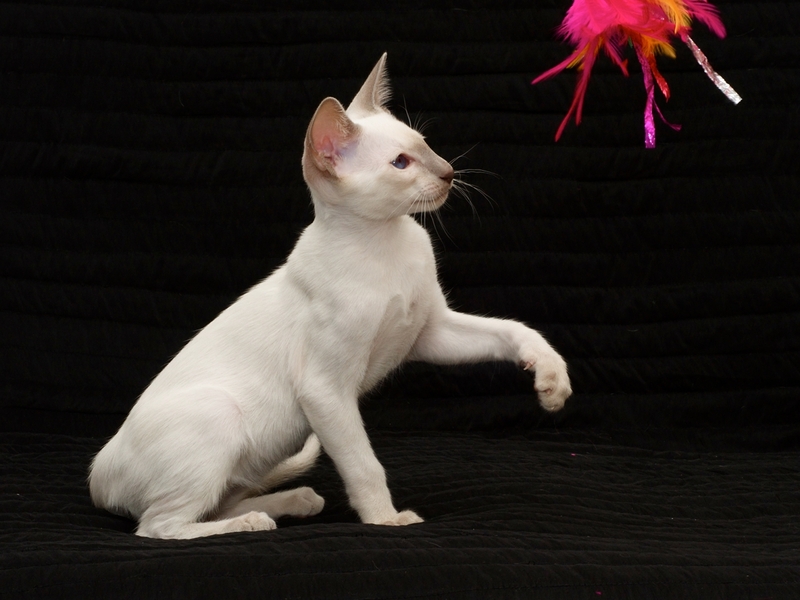 We did not plan to have any litter soon, so we decided to exhibit Claire, since white Siamese are rare, and that way people can get to see her. When it comes to beauty – Albert and Jossan are our prettiest cats, but Albert is not fond of being lifted after his injury (I hope he forgets about it now when he is operated and fine), and Jossan is fertile and can get upset and nervous if she is close to male fertile cats, so I do not want to stress them. Leroy is chubby, and Miii is caramel blue, not ‘ordinary’ blue (caramel is recognized in England, but not here in Sweden, so she would have to compete with the “true” blue Siamese and she would get low points for her fur color, which is not fair. They are not even the same color! 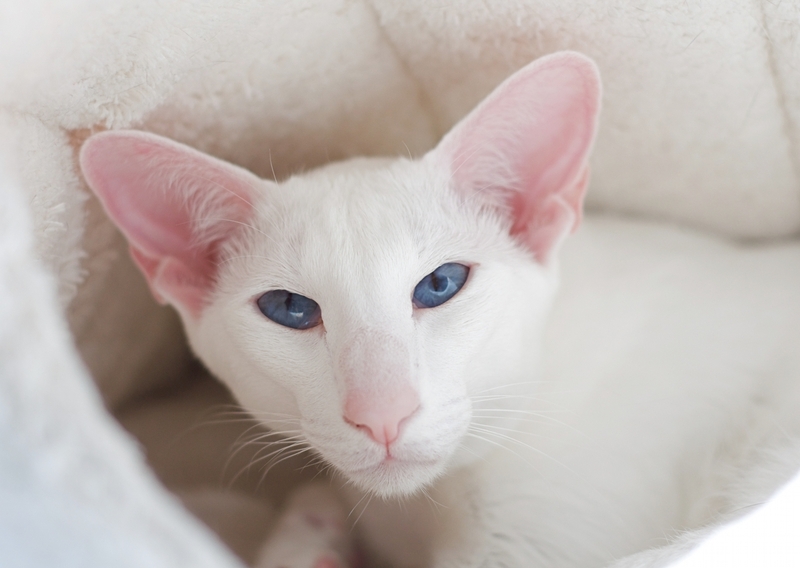 Jossan and Miii’s grandfather was an import from England and had the same, amazing fur color, which is not that appreciated in Sweden). Maven cannot be exhibited, not because she is a mixed breed – there is a class for them, too; the reason is that she has a tail kink. But, we did not want to take little Claire there alone! And so we thought – Leroy, although chubby, is such a cool cat, and has a lot of charisma. That counts for something, right? So, we decided to take Leroy as a company for small Claire, and since he already was going to be there, he could compete in his class as well (class 10, neuters). 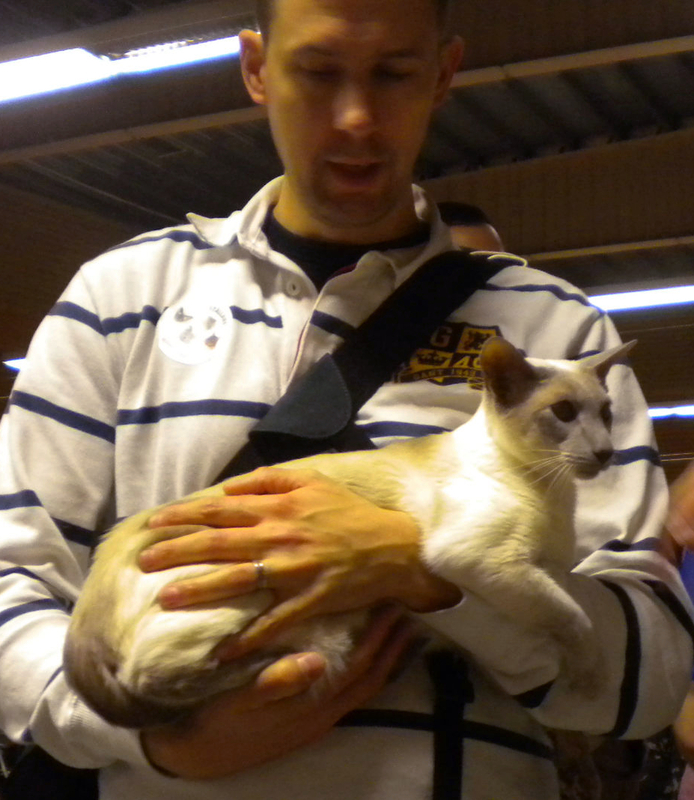 And so we went to Birka cat club’s two-day exhibition last weekend. It went really great! Leroy got his first two certificates, CAP (Certificat d’Aptitude de Premier )! Wow! Both judges said (in a very polite and nice way) that Leroy is a bit chubby, but also, that he is neuter and almost 6 years old, so some extra weight is not unexpected. Well, I am trying (still, in spite what he may be thinking) to get him slimmer! And not for the beauty reasons, but for his health. Anyway, this is what they got as evaluation from the judges, on Saturday and Sunday. You’ll see, it is good! “Exc” and “Ex” stands for “excellent”. The ladies that judged our cats were very nice to them. Thank you! What matters the most to us is that the cats took being there pretty well, especially Leroy who enjoyed all the attention and was curious about the other cats. Type: Big boy. Exc body length. Head: Head could be a bit more ‘edgy’ as to details. Eyes: Ex blue, but too dominant. Coat: Ex short, ex close lying with some shades on corpus. Tail: Fitting with body length. Exc! TYPE: Very long, strong muscled body ex high on legs. Still a teenager, babyround. HEAD: ex strong prophile ex.wedge. Nice length of the triangle. Almost straight sidelines. Sharp profile, could have more height om forehead. EYES: beautiful deep blue. Nice shape and size, ex deep blue colour. EARS: ex size, medium low set. Very classic earsetting and size. COAT: ex. clear points, soft silky and close lying. Really fully developed points to for his age. Ex.lilac colour. TAIL: ex.long, tapering. Could be a bit more tapeurs, a bit thick on base. CONDITION: super showcondition. Lovely condition, very sweet and gentle. GENERAL IMPRESSION: Lovely. Young boy who still needs time to develop. Congratulations and many thanks to Agneta for showing Tjabo!